Free guitar tablature paper is a necessary tool for the guitar teacher! Check out these EIGHT sizes of blank free guitar tabs -- they are offered in different sizes so you can choose what works best for you. Just because a student can't read standard notation yet is no reason for them not to play actual songs. Show your beginning guitar player how to read tab during their first lesson or two, and it will be for them a "Eureka!" moment -- as exciting as discovering how to decipher Morse code -- but so much easier! 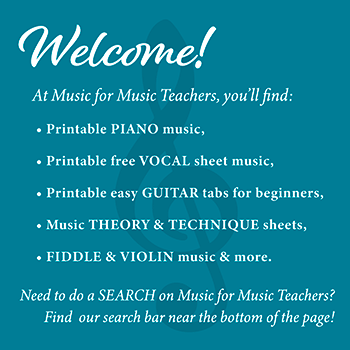 SCROLL DOWN THE PAGE for the links to the free printable PDFs of tablature sheets. Reading guitar tablature is really fun. You may worry that you won't be able to wean a student off of it. Well, I read both standard notation and guitar tab, and find that they both have their uses! Just be sure you are bringing your beginning guitar player's note-reading along with a beginning guitar book that slowly teaches note-reading (with no tablature on the page) and they will do fine. Something I have discovered is that using a staff or tablature WITHOUT BAR LINES is much more efficient! Little boys - and other people, too - have trouble squeezing an unknown melody into a small space (unknown, that is, if I am dictating to them)! This is a very handy size for children. Today I had a little boy write the guitar tabs for "Jingle Bells" in the key of G onto this paper, as I slowly played it (again and again). IT MADE SENSE TO HIM, and he is one who has struggled to be able to read tablature well. 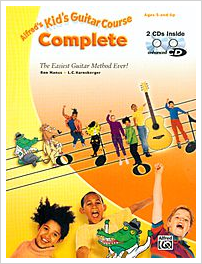 I have one nine-year-old guitar student who claims he doesn't read yet (and his mother agrees). He cottoned on to guitar tab right away... piano notation, standard notation would have been much MUCH harder. Guitar can be a good choice for a student who is a slow or non-reader. On piano, ten fingers. On guitar, one pick. For starters, anyway...later on, finger-picking won't seem so overwhelming, especially if you start with a super-easy chord accompaniment such as my version of Down in the Valley. So do your young guitar students a favor, and write songs out for them on tab sheets! Check out Pizza, Please, (my version of Hot Cross Buns) for a super-easy guitar song for beginners. The tab sheet with treble clef staff is my personal favorite, because producing a piece of music using both staff types allows any other musician to join along. When there is a sister or a brother (or grandma, or dad, or...) in the family who also plays an instrument or sings, well, they will all want to get into the act!